Slapton Sands offers over three miles of beautiful beach on the South Devon coast, and also sits opposite the Slapton Ley National Nature Reserve. Looking for specific information about Slapton Sands? Sat nav users, use the postcode TQ7 2TQ for Torcross. As you drive out of Dartmouth up College Way, take a left at the mini-roundabout, signposted for Stoke Fleming and Strete. Then simply follow the A379 as it winds its way to the village of Stoke Fleming. Carry on through the village and after a few miles Start Bay will appear in front of you. Continue downhill, passing Blackpool Sands on your left. The road will then wind up and down a steep hill, offering some wonderful views. Carry on along the A379 passing the edge of the village of Strete. Half a mile later you’ll reach the beach. You can turn left and park at the northern tip of Slapton Sands, stop at the central car park or continue to the southern side of the beach, where you’ll find more parking and the village of Torcross. Drive to the outskirts of Dartmouth, go straight on at the first roundabout you reach, and then turn right at the second. From there, follow the above directions from (2). This coastal option provides one of the most scenic drives in the South Hams. Leave Kingsbridge along the Promenade/A379, signposted for Dartmouth. Stay on this road, passing the villages of West Charleton, East Charleton, Frogmore, and Chillington. At Stokenham, you’ll come to a roundabout. Continue straight on and you’ll soon arrive at Torcross, and a stunning stretch of Start Bay will appear on your right. You can park at Torcross, which will give you the chance to see the poignant war memorial, continue halfway down the beach to the next car park, or drive the length of the bay and park on the Strete side of Slapton Sands. Slapton Sands is on the South West Coast Path. It is a challenging walk from Dartmouth (around 9 miles which includes some steep slopes). Alternatively, take the 93 bus to Blackpool Sands and walk four miles to Torcross for a condensed walk with stunning scenery. There is ample parking at Slapton Sands as both ends of the beach (plus the middle) are served with their own council-run car parks. Charges apply throughout the year. You can find the prices here. Slapton Sands is popular with sunbathers, swimmers and anglers and, as a longer beach, it provides ample space for ball games and frisbee etc. Parallel to the beach, you’ll find opportunities for bird watching and nature walks at the Slapton Ley National Nature Reserve. Slapton Sands is a picturesque pebble beach, stretching to over three miles, with some of best scenery in the South Hams. 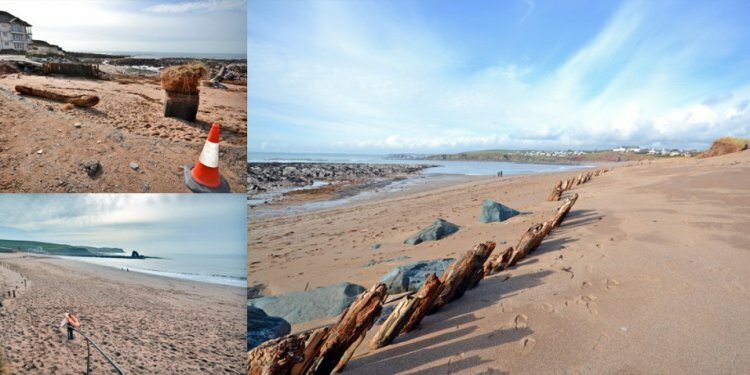 It’s very spacious and seems to be something of a secret amongst South Devon beachgoers, which means there’s plenty of space to spread out and have fun. That’s what makes Slapton Sands such a good choice for families, as well as dog owners as the beach welcomes your four-legged friends all year round. In some ways, Slapton Sands feels like three separate beaches: the busier Torcross side has most of the facilities, such as the charming Start Bay Inn and the Sea Breeze Café and Takeaway. It’s at Torcross that you can also see the poignant war memorial – a Sherman tank reclaimed from sea to remind us of the 639 soldiers and sailors who lost their lives off Slapton Sands during Exercise Tiger in 1944. Torcross also offers access to the Slapton Ley National Nature Reserve, where you’ll find the largest freshwater lake in South West England. Events for nature-spotters and birdwatchers are organised throughout the year and there are several walks and trails to enjoy. Before finding a spot on the beach, there are several different places you can pick up a sandwich, ice cream or even the traditional Devon fish and chips for when you want something more substantial. For dog owners, Torcross beach and the whole of Slapton Sands allows dogs throughout the year, with miles of beach for them to run around on (making sure to watch the road that runs alongside the beach). Torcross is also suitable for anyone with mobility restrictions, with disabled beach access and toilets as well as plenty of conveniently located parking. The sea at Torcross is great for those who are brave enough to go for a swim! It is clean and a popular place for children to go paddling in the water. Many anglers prefer the Torcross side of the beach because the rocky seabed provides a wider range of species than you’ll find in the central area and it is easier to reach this end than the northern limits of the beach. The whole of the beach is productive for mackerel in the summer – since there’s enough beach for everyone this can be a great family activity when the sun’s out. Overall, the Torcross side of Slapton Sands is a fantastic place to spend a beach day and is often overlooked in favour of other, better-known beaches in the region. Perhaps it’s for this reason that local residents often favour Slapton Sands and nearby Blackpool Sands than the more ‘touristy’ beaches in South Devon.